English Inn features an intimate, welcoming and elegant atmosphere coupled with friendly, attentive service. Our Green Bay location – the newer of the two – is situated on a cliffside just 15 minutes from downtown Green Bay, offering a spectacular view of the water and surrounding scenery. 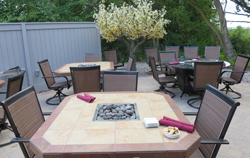 This location also features outside dining options and cozy fire tables. I had dinner at the English Inn restaurant at their newer second location, which is located on Bay Settlement Road, on the outskirts of Green Bay. Right before you enter into the restaurant you are immediately put into the mood of old time England, for there is an upright silver suit of armor situated at the front entrance.The interior is warm and plush with thick floral carpeting dark woodwork and at the center of the room hangs a gorgeous massive crystal chandelier. Since it was a beautiful summer evening I decided to dine on their outside patio. 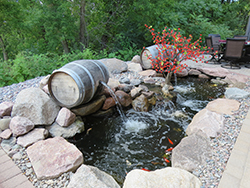 The patio was beautifully designed, there is a large rock waterfall with Koi fish swimming inside, twinkling lit trees, and in the middle of all the tables there is a gas charcoal fireplace. The view is wooded with a partial view of the Bay and there are electric heaters for those cool evenings and relaxing music for your enjoyment. After being seated immediately my server came right away and introduced her self and handed me their dinner menu and a separate wine list. She brought me ice water and then explained to me the specials for that evening. Their menu is very extensive with a good diversity of entrees and many options of sides to choose from. 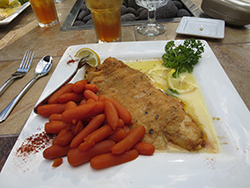 I decided on the baked grouper for $26.95 which includes a bread basket, potato, and your choice of soup or salad. The English Inn offers 2 selections of soup clam chowder or French onion. For salads their are 6 different types which you can add different cheese or protein for an added cost. They also offer 5 different potato choice, a rice pilaf or glazed honey carrots. I decided on the garden salad and the honey carrots. While I waited it was very relaxing listing to the waterfall and music playing in the background while viewing the area. A wind picked up and I put on my jacket and soon after my very observant server brought out to me a soft thick blanket for me if I chose to put on my lap, what wonderful service. I was brought out first a warm loaf of bread with dipping oil. Then soon after came my salad. 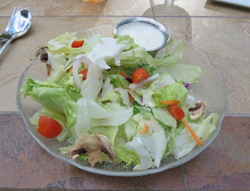 My salad consisted of ice burg lettuce and sliced broccoli, fresh mushrooms onion and tomato. The salad was average in flavor. Followed soon came my entrée which looked delicious. It was a large fillet hand dipped in sour cream, Parmesan cheese and basil, coated with seasoned bread crumbs and was served with lemon Blanc sauce. Next to my filet was a large portion of the glazed baby honey coated carrots. The entrée was attractively presented. My grouper tasted luscious with a wonderful lightly sweet flavor and with the accompaniment of the lemon Blanc sauce hit just the right note. The carrots were extremely tender and sweet. My dinning experience at the Green Bay English was delightful. The English Inn also has a another location in Fish Creek in the beautiful setting of Door County.